This work traces the historical processes in thought by which American political leaders slowly edged away from their complete philosophical rejection of a party and hesitantly began to embrace a party system. In the author's words, "The emergence of legitimate party opposition and of a theory of politics that accepted it was something new in the history of the world; it required a bold new act of understanding on the part of its contemporaries and it still requires study on our part." 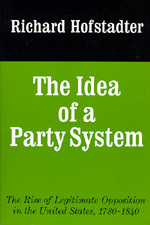 Professor Hofstadter's analysis of the idea of party and the development of legitimate opposition offers fresh insights into the political crisis of 1797-1801, on the thought of George Washington, Thomas Jefferson, James Madison, James Monroe, Martin Van Buren, and other leading figures, and on the beginnings of modern democratic politics. The late Richard Hofstadter was DeWitt Clinton Professor of History at Columbia University. He was the author of many books and articles on American History and twice received the Pulitzer Prize: in History in 1956, and in general nonfiction in 1964.